January 3, 2017, 7:54 PM · Disneyland California Adventure, Hollywood Land, 2017, January 2nd. That night’s story was somewhat unique and calls for a different kind of introduction. The Twilight Zone Tower of Terror, as you may recognize, had a maintenance service elevator still in operation… but after that day, it moved into a land of both shadow and substance, to disappear from Disney California Adventure forever. 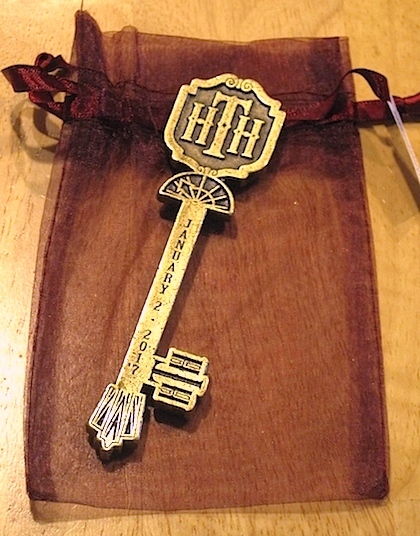 The shuttering of The Tower of Terror was commemorated with a special, “13th Hour” ticketed event. It began at 10pm on January 1st, and concluded at 1am on January 2nd—the attraction’s final day of operation. 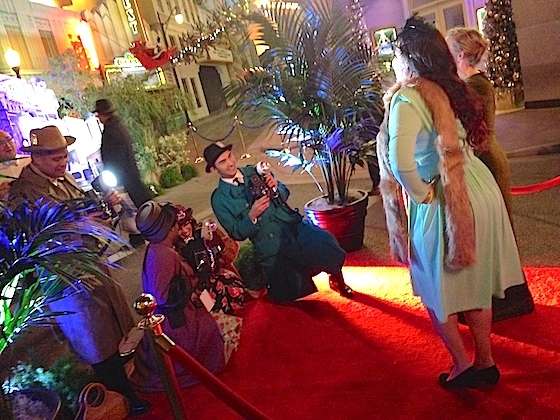 This event boasted the regular version of the ride (not the lights out, “Late Check-Out” version that had been running after sundown in the park after news of the attraction’s closure)—and as the announcement for the “posh event” encouraged, guests dressed the part of the “Golden Age” and donned their best fedoras, furs, and bellhop fashions. In taking the tram from the Mickey and Friends parking structure to the park, it was quite easy to spot who was attending this event, as per Disney’s policy prohibiting adults to wear costumes, one doesn’t usually see guests in full costume shuttled to the gate. And after the trams dropped off their passengers, I noticed many guests were confused at only being directed to check in at the “esplanade.” As a writer, I will claim I knew exactly what this meant… without having to look it up. But for anyone who’s wondering, it’s the large, open space between the gates of Disneyland and DCA. Once I found the check in tables on and received my credentials, I, as well as the other guests within earshot of me, were told by several cast members that there was no line to enter the event, and that the area around the Disneyland ticket counters were only a “holding area.” With this information, many guests who had arrived early left for Downtown Disney until the event started, only to return and find that a considerable—and quite formal—line had indeed formed. And, let’s just say several of these guests were none too restrained in voicing their displeasure at being provided misinformation. Once inside Hollywood Land, as promised, there were several unique photo opportunities including a façade of The Hollywood Tower Hotel, a Hollywood premiere–style red carpet being covered by Cast Members in era reporter dress, and a chance to grab a pic with Chip and Dale in front of the Hollywood Tower Hotel/Tower of Terror sign. With the announcement of ToT’s closure, the park already added a photo opportunity by the sign in adding a luggage cart and bags for guests to pose with. Despite the line snafu at the beginning of the night, the Cast Members were at the tip-top of their game. Those playing a Golden Age character did not break the entire evening. For example, when you handed your cell phone to one of the Reporters to take a picture for you, he or she pretended to not understand what a cell phone was or how the touch screen camera worked. Continuing that same level of commitment, all of the Bellhops were in grim character and significantly contributed to the experience by adding their personal dark twists—there was no perfunctory parroting of the script that night. All and all, the evening was great fun and I feel well worth the $100 ticket price. In that night’s episode of Twilight Zone, I felt I was the star. Though some may say that the DCA version was never the best iteration of ride, I heard many guests throughout the night lament its leaving. The next time they wave goodbye to the real world and check into a deserted hotel on the dark side of Hollywood, it’ll be a bit farther away. January 4, 2017 at 7:42 AM · Wait, it was $100 *plus* $35 for the key? Ouch. January 4, 2017 at 10:16 AM · So Jeff, were you dressed for the era? Where are you photographs? January 4, 2017 at 11:24 AM · Sounds like a great event, but glad I passed. Amazing that people are crying for the attraction. It did nothing to move the needle when the park underperformed. The attraction lacked the buildup that you see at DHS. Hollywood Backlot still looks unfinished, but that was intentional and this will lead to its demise. If only it was designed for California Adventure as an unique ride, it might have a chance. January 4, 2017 at 1:31 PM · $100 for a 3 hour event, plus you had to buy the alcohol and the keepsake? Did this include admission to the park, parking? Was the TOT the only open attraction? I am a big Disney park fan, and I have a substantial disposal income, but I'm finding this trend of gouging the Disney park fanatics for 'special' events to be alarming. From the Jungle Cruise $300+ brunch (I still can't get over that) to the $49 pre show for Frozen, and the ridiculously priced dessert plate for WOC. I can just imagine the Star Wars 'special events' that will be offered before SW Land opens. I'll bet they will be well over $500 per person, plus admission and parking, mark my words. January 4, 2017 at 3:59 PM · I still believe Disney is going to regret doing this to the Tower of Terror. January 4, 2017 at 11:53 PM · All I can say is, I'm glad they won't be butchering the theming of the TOT in Orlando. I'll still be able to ride the "real" Tower when we go there next October. January 5, 2017 at 8:12 AM · Biggest mistake at Disneyland Resort since Rocket Rods. January 5, 2017 at 1:36 PM · Can anyone tell me what the proposed opening date on the Guardians of the Galaxy version will be? Sorry if it was noted somewhere before, but I can't find this info anywhere. We'll be there in late March, and I'm wondering if there's any chance it will be ready by then, since it's kind of just a remodel. No such luck, I bet, huh? January 5, 2017 at 2:25 PM · I feel obligated somehow to speak up in defense of this transformation. First by saying that the ToT at DCA was routinely criticized for not being on par with the DHS version and it would have always suffered this comparison. And that I found both versions to be somewhat overrated. Ironically, we fans who are always talking/complaining about clones are making the biggest stink about this. Finally, Disney is not going merely retheme the Tower of Tower like at DisneySea, rather they are replacing the whole supernaturally cursed hotel elevator with something completely different. So not only will Orlando still have the original it will have the *only* Tower of Terror in the USA. And DCA will have what essentially will be a new (and original) drop tower. Given than it's going to anchor a whole new Marvel themed land I think it's a smart move that Disney will not regret making and naysayers will proved wrong.